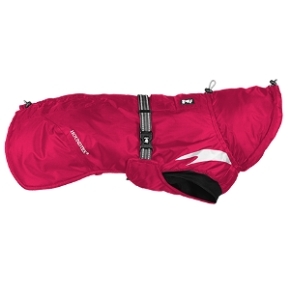 Hurtta Outdoors Summit Parka Cherry 45cm / 18"
Home > Hurtta Outdoors Summit Parka Cherry 45cm / 18"
The Hurtta Summit Parka is a simple and efficient way to keep the dog's body temperature stable in cold weather. The winter jacket is designed to complement the thermal insulation capacity of short-haired dogs and dogs with no undercoat. The highly technical winter jacket protects your dog's most important muscle groups, chest and the sensitive abdomen area. Quick to put on and take off, the jacket is particularly well suited for warming up the muscles of active dogs before or after training. The product has a water-resistant and breathable Houndtex coating and high-visibility 3M relectors. Recommended for demanding use. Hurtta Outdoors Summit Parka Cherry 35cm / 14"